The snowstorm forecast from meteorologists was dead-on and is about to turn into a nightmare for some 50 million people in the East Coast. The forecasters are calling for snowfall that will be measured in feet, gale force winds, coastal flooding and white-out conditions. Blizzard warnings stretched from Washington to New York with heavy snow likely to go even further north than that, stopping just short of Boston. Here's a look at some of the best photos and videos of the snowstorm that have been posted to social media. At Chicago O'Hare International Airport, a plane from San Francisco slid off the runway. Click here for the full story. Crews at O'Hare were busy earlier in the day trying to clear snow off the runways. 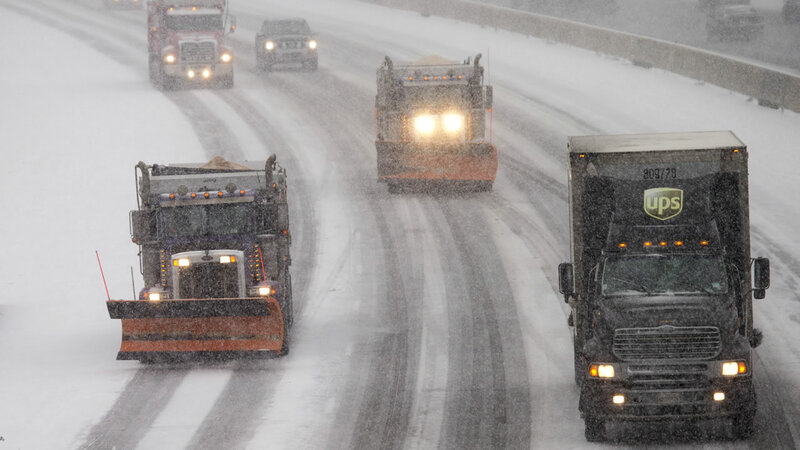 This YouTube video from Patrick Grzywa gives us an even more in-depth look at snowplows hard at work in Chicago. The snowstorm bearing down on the nation's capital is not stopping the small group of soldiers who continually stand guard at the Tomb of the Unknowns at Arlington National Cemetery. The U.S. Army shared this photo on Instagram. Click here for the full story. This person posted a video to Twitter and said, "When you can't make practice because of the snow and ice @swimswamnews @SwimWithIssues." As many people hunker down to ride out the blizzard, this flight attendant is celebrating because she's "happy" to leave Washington D.C. for better weather. You know it's serious when taking the dogs out for a walk involves ski equipment. Be prepared! Brett Yoh took this photo of a sign in Baltimore warning residents to plan ahead. Why walk when you can hitch a ride in a canoe strapped to an SUV? Since a Trader Joe's in Washington D.C. reportedly locked their doors because of too many people in the store, people flocked to this Safeway where lines extended down the aisles. A video posted to YouTube by Depth of Field Productions gives us a unique perspective of the snowstorm that hit eastern Tennessee and blanketed Neyland stadium. An Instagram video shows a dog enjoying the snow in Nashville. Also in Nashville, Marisa took timelapse video of a person attempting to shovel a walkway as snow continued to fall heavily around him. Meanwhile, in North Carolina, Kelly D. took a timelapse video of the snow falling in her backyard. What's the weather like #whereyoulive? Tag your photos and videos on Twitter, Instagram, or Facebook with #abc7now and we may show them online or on TV!